Since President Dwight D. Eisenhower first protected the Arctic National Wildlife Refuge more than 50 years ago, subsequent presidents and houses of Congress have time and again resisted the urge to allow oil drilling in the place known as “America’s last great wilderness.” In 1995, President Bill Clinton vetoed a budget bill because it would have sacrificed the Arctic Refuge to drilling. In 2005, the Senate handed a bipartisan defeat to President George W. Bush’s attack on the refuge. Today, the Arctic National Wildlife Refuge is facing its largest existential threat since its inception. As part of a bill to reduce federal tax rates for corporations and wealthy individuals, the Trump administration and Republican leadership in the Senate are expected to add a legislative rider that would open the Arctic Refuge to drilling. Specifically, the Senate Energy and Natural Resources Committee has been instructed to find a way of generating an additional $1 billion in revenue—presumably through selling oil leases in the Arctic Refuge—to help pay for the tax cuts. Under President Donald Trump’s banner of so-called energy dominance, this latest push to sell out the Arctic Refuge to the oil industry is morally bankrupt, overwhelmingly unpopular, and fiscally dishonest. A Center for American Progress analysis finds that offering oil and gas leases in the Arctic National Wildlife Refuge is likely to yield no more than $37.5 million in revenue for the U.S. Treasury over the next 10 years—far short of the $1 billion to $1.8 billion that drilling proponents claim could be raised. More importantly, the Arctic National Wildlife Refuge is no place for industrial oil fields. The refuge is an irreplaceable landscape where caribou, moose, snowy owls, arctic foxes, polar bears, and other wildlife thrive amid an unbroken and untrammeled habitat. The native Gwich’in people have inhabited this region for generations and rely on the health of its land and wildlife for food, clothing, and cultural survival. With the western part of the lower 48 states already losing a football field of natural area every two and a half minutes, Congress should not let one of the last untouched parts of the country be sold to the highest bidder. The unmatched beauty and remoteness of the Arctic National Wildlife Refuge are why, according to national public opinion research commissioned by the Center for American Progress and conducted by Hart Research Associates, two-thirds of American oppose drilling in the area, including 71 percent of unaffiliated voters and 58 percent of independents. Drilling in the Arctic Refuge is likely to yield no more than $37.5 million for the U.S. Treasury over 10 years. That is not nearly enough to cover the costs of President Trump’s personal tax cut under the Senate Republican plan. The federal government’s revenues over the next 10 years from oil and gas drilling in the Arctic National Wildlife Refuge would come entirely from bonus bids that companies would offer to buy the rights to drill in a 1.5 million-acre area of the Arctic Refuge’s coastal plain. Because the area is so remote and there is no existing oil infrastructure in the Arctic Refuge, no oil production is likely to occur within 10 years, and therefore the federal government would receive no royalties from oil production within the next decade. To estimate revenues that the federal government is likely to receive through bonus bids for drilling rights in the Arctic Refuge, CAP reviewed historical lease sale data for other areas of Alaska’s North Slope. Since 1999, the federal government has sold drilling rights to 5.6 million acres of federal land in the National Petroleum Reserve-Alaska (NPR-A) which lies to the west of the Arctic Refuge, for a total of $281 million. The average high bid for leases in the NPR-A in this period was approximately $50 per acre. If all 1.5 million acres of the Arctic Refuge’s coastal plain were sold for oil drilling over the next 10 years at an average bonus bid of $50 per acre, the federal government would receive $75 million in revenue. After providing the State of Alaska a required 50 percent share of federal energy royalties, the U.S. Treasury would receive just $37.5 million. There are several reasons why $37.5 million is itself a high-end estimate of revenues that would be received by the U.S. Treasury if the Arctic Refuge would be drilled. The most recent lease sale by the state of Alaska for lands on the North Slope between the NPR-A and the Arctic Refuge yielded $28 per acre, well below the average bids received in the NPR-A. Still, government officials involved in this 2016 lease sale of state lands on the North Slope reportedly described the results as “outstanding” for the high value of the bids. This area is also closer to the Arctic Refuge and therefore may better reflect the current market’s valuation of potential resources in the Refuge’s coastal plain. It is implausible that all 1.5 million acres of the Arctic Refuge’s coastal plain would receive bids, which would further reduce revenues. Oil companies that wish to bid on parcels in the Arctic Refuge will likely discount their bids because of the policy uncertainty they would face. Drilling in the Refuge would be highly controversial, likely delayed or stopped by litigation, and potentially blocked by future congresses or presidential administrations. Furthermore, oil companies that market directly to consumers will be aware of the negative national and international impacts that drilling in the Arctic Refuge will have on their brands and reputations. Oil companies seeking to uphold corporate responsibility standards may choose to not bid on parcels, which would further reduce bonus bids and federal revenues. Proponents of drilling the Arctic Refuge claim that the U.S. Treasury will see at least $1 billion in revenues over the next 10 years. Instead of relying on historic and recent lease sale data from other areas of Alaska’s North Slope, these projections are based on outdated resource estimates and ignore production costs and market conditions. When making their bullish revenue projections, drilling proponents are still citing a 1998 study by the U.S. Geological Survey (USGS) of undiscovered oil resources for the Arctic Refuge. For comparison, in 2010 the USGS corrected its previous 2002 year resource estimates for the NPR-A, reducing by 90 percent the amount of oil that is believed to exist in that section of the North Slope. This significant downward revision of resource estimates for the NPR-A renders the 1998 Arctic Refuge resource assessment highly unreliable for the purposes of generating budget projections. The broader legislation to which the Arctic Refuge provision is being added would increase the federal deficit by $1.5 trillion, including through tax cuts for the wealthy. 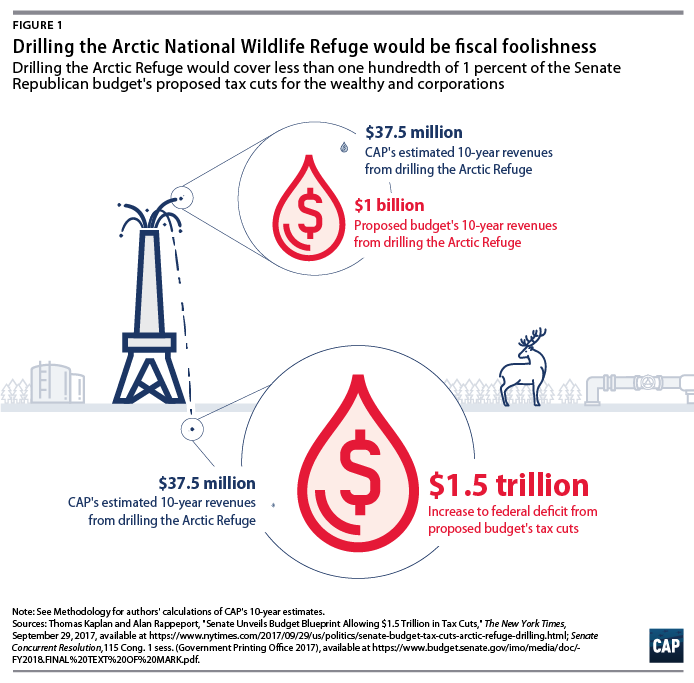 Even under the overly optimistic fiscal estimates of drilling proponents, revenues from oil extraction in the Arctic would offset less than 1 percent of the increased deficit in the tax bill. Oil prices are constantly fluctuating. The Congressional Budget Office has pointed out that at current low oil prices, drilling in the Arctic Refuge is not an effective strategy for increasing revenues. The rapid rise in production of oil from shale oil plays in the lower 48 states is expected to exert downward pressure on oil prices for years to come, and the availability and accessibility of these resources makes it even more unlikely that oil companies will want to gamble on drilling the Arctic Refuge. Oil executives are keenly aware that the average break-even price for North American shale oil is more than $10 per barrel cheaper than Arctic plays. Energy forecasters also predict that shale oil production in the lower 48 is not likely to diminish soon: EIA estimates that this type of shale oil will continue to make up the large majority of new oil production through 2040. Royal Dutch Shell abandoned its oil exploration program in the Arctic Ocean in 2015 after spending upwards of $7 billion and showing just how risky Arctic drilling can be for both industry and the Arctic environment. The project was plagued by problems. Most notably, Shell’s oil containment dome was “crushed like a beer can” in testing and test wells failed to prove economical. The coastal plain where drilling would occur is considered the “biological heart” of the Arctic Refuge. The infrastructure, rigs, pipelines, roads, and machinery required in industrial-scale drilling operations would put the 37 species of land mammals, eight marine mammals, 42 fish species, and more than 200 migratory bird species within the Refuge at extreme risk of habitat destruction. 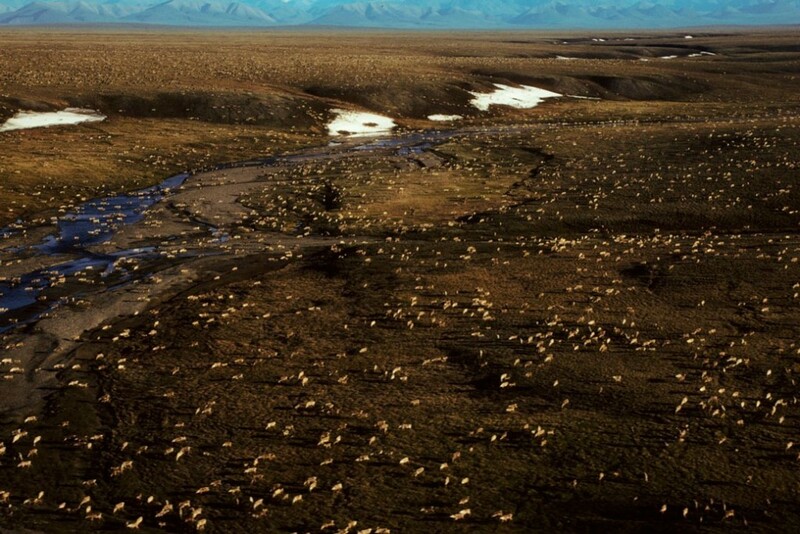 Alaska’s coastal plain is the primary breeding ground for the largest caribou herd in the Arctic Refuge. The Porcupine Caribou herd is a staple for the indigenous Gwich’in people, whose way of life would be irreparably changed if oil and gas interests are able to open the area to development. The Arctic, where temperatures are rising at twice the rate of the rest of the world, is ground zero for climate change. More fossil fuel extraction will compound the devastating effects already being seen from climate change throughout the Arctic. To start, Congress could cut some of the estimated $20 billion in subsidies given to fossil fuel companies each year. Congress could also update the 1872 Mining Act to require—for the first time ever—that mining companies pay more than zero dollars to extract taxpayer-owned gold, silver, and other minerals from public lands. The upcoming debate in Congress about whether to sell out the Arctic Refuge is not actually about budgets or taxes. The caribou of the Coastal Plain are not grazing atop a pot of gold. And Americans are likely to see the Arctic Refuge drilling rider for what it is: a backdoor giveaway to oil speculators and their lobbyists. Members of Congress hold America’s last great wilderness in the balance; they would therefore be wise to listen to their constituents and uphold our nation’s longstanding, bipartisan tradition of protecting the Arctic Refuge. The authors would like to thank Emily Haynes, Shanée Simhoni, and Cecile Samuels for their contributions to this column. Matt Lee-Ashley is a senior fellow and the senior director of Environmental Strategy and Communications at American Progress. Jenny Rowland is the research and advocacy manager for public lands at American Progress.